If your child has a raised temperature, or fever, it may be a symptom of a cold or ‘flu or a more serious illness, such as tonsillitis, chickenpox, middle ear infection or measles. A normal temperature is between 36° and 37°C (96.8-98.6°F) and fever is defined as over 37°C. A fever may be accompa­nied with other symptoms, depending on the cause of the ill­ness, such as headache, drowsiness, rapid breathing, sweating, irritability, flushed face and shivering. 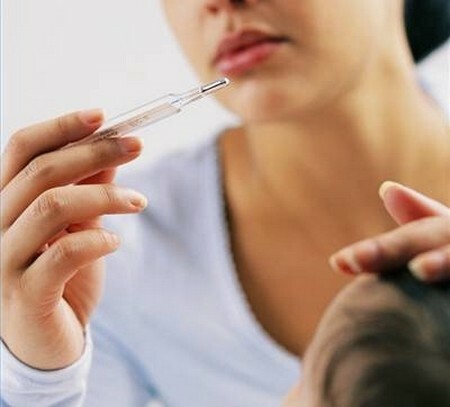 A fever is serious in a young baby, particularly in those under six months, as it may cause febrile convulsions, when the baby will twitch or jerk and lose consciousness for a few minutes. 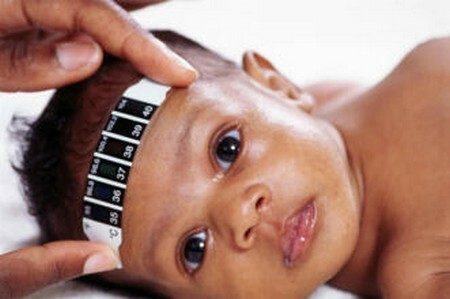 Monitor your child’s temperature regularly if they have a fever. Keep them in a cool room and cover with as little as possible. Sponge down your child all over with tepid (not cold) water, until their temperature begins to fall. Give plenty of fluids to drink. Don’t give aspirin unless advised by a doc­tor. Let the child sleep as much as they want to. Herbal medicine sees fever as the body’s way of expelling, so it is a perfectly natural function that should not be suppressed. But Elderflowers may be recommended to help with the fever and are also a useful natural laxative. Yarrow is also known to help the body deal with fever and Lime Blossom has properties which will help any sweating and also relax the child. A herbalist may also recommend giv­ing one teaspoon (5ml) of cider vinegar in a cup of water, to be sipped throughout the day. There are a number of remedies that may be recommended, depending on the personality of the child and how they feel about being ill. Crab Apple has a cleansing effect and so is useful after any illness to help purify the body and get rid of the feeling of sickness. If the child is lacking energy after being ill, Olive may help the child to return to normal by helping to restore strength and vitality. If the temperature rises suddenly, and the child is very thirsty and has hot skin, Belladonna may be recom­mended. If the baby seems very fidgety and restless and is worse late at night, Arsenicum may be useful. If movement causes the baby distress and large amounts of fluid are being drunk, Bryonia may also be useful. A homoeopath or other practitioner may also recommend the use of tissue salts for fever. Ferr. phos. is thought to help with symptoms. Kali mur. may also be advised for any accompanying catarrh or cold. If your baby suffers a convulsion, call your doctor immedi­ately. Other therapies mat may be beneficial: reflexology, aromather­apy.